Head inland and you'll find the gorgeous, quintessential, romantic country town of Bangalow. It's 2479 postcode covers an area that incorporates the township of Bangalow and a surrounding rural population including St Helena, Coorabell, Possum Creek, Newrybar, Binna Burra, Brooklet, Nashua, Fernleigh, Knockrow and part of Coopers Shoot. The township has expanded greatly over the past two decades, with several new residential subdivisions spreading towards the town boundries. Bangalow is renowned for its strong community spirit and has one of the largest populations of families in the shire. 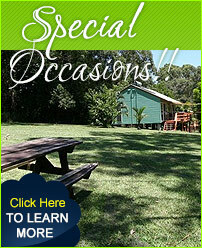 Bangalow is renowned for its picturesque countryside and agriculture persuits. The surrounding green, rolling hills are a patchwork of fruit trees, macadamia orchards, coffee plantations, dairy cattle and other agricultural activities. Many specific events happen in Bangalow through the year and it is quickly gaining a reputation as a centre for music and cultural development.